Problem: R.D. 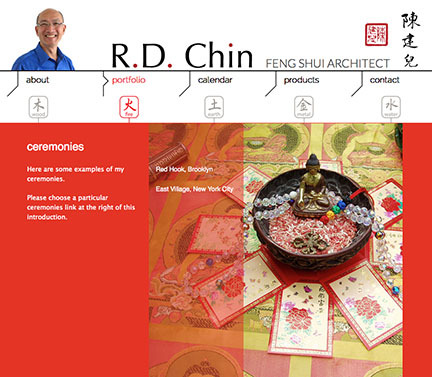 Chin was ready to invest in a site that would increase his client base. This included adding an event calendar, creating dynamic image galleries & videos, setting up a contact form, and programming a custom navigational system. R.D. has a passion for what he does, and the fun and unconventional visual compositions of the web pages reflect his complex character. Solution: We experimented with a wide range of unconventional layouts. From the playful menu items, with colorful symbols of the five elements, to the semi-transparent navigation submenus, the main purpose was to create a memorable, yet easy to navigate, site. I highly recommend working with Alex Canelos of Sevenfold Studio in creating or updating your website! He is very knowledgeable in the technical practicalities, and as a creative artist and designer. Working with Alex was truly an organic process which resulted in a lively, interactive and colorful website. It is a pleasure to work with him and I look forward to our continuing collaboration.